Repetitive stress or unnatural stress placed on the surface of a bone, often from muscle fatigue, can lead to stress fractures.Running, jumping, and other high impact activities can lead to small cracks or fractures, along a bone. 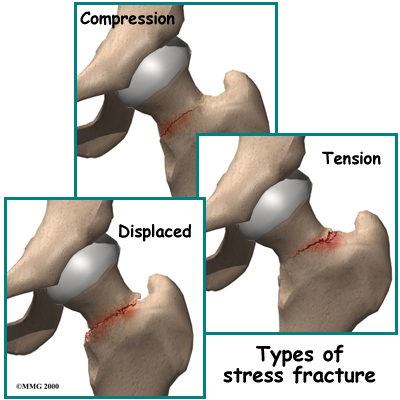 Stress fractures can occur in any bone subjected to repetitive stress or impact. Stress fractures cam occur in any bone but are most commonly found in the bones of the foot, lower leg, and hip. When a muscle becomes fatigued and can no longer absorb the shock of impact, that stress gets transferred to the bone. Over time that stress will cause small cracks in the bone. Fatigue in certain muscles may also create strength imbalances that put an unnatural stress on the bone causing small fractures. Stress fractures to the pubis, femoral neck, and proximal third of the femur are seen individuals who perform aerobic dance activities, or extensive jogging. Repetitive stresses from impact activities. 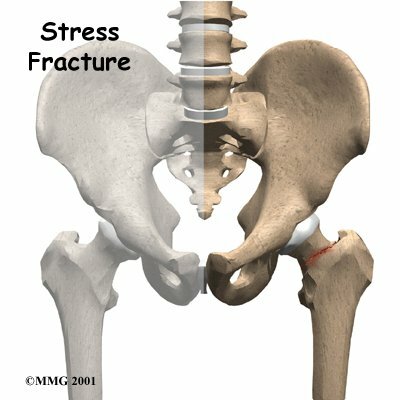 Unnatural stress on a bone from different running surfaces. Strength imbalances causing unusual stress. Generalised area of pain. Pain with weight bearing. When running, the pain is severe in the beginning, then none-to-moderate pain in the middle, with severe pain returning at the end and after the run. When left unattended a stress fracture may develop into a more serious complete fracture. The pain and natural guarding of the injured area could lead to future injuries in other areas. Restoring flexibility to the entire hip girdle is important when the pain subsides. Gradual involvement in the athletic activities is also important. Stop an activity if it causes pain. Strengthening the adductor muscles and the hip flexors also prepares this area to handle the stresses more efficiently. Proper warm-up techniques before running, kicking or other direct impact activities are important as well. When treated properly, there are seldom any long-term effects. Full range of motion and strength should return. If pain and limited monility linger, the injury should be re-evaluated. Call (+65) 64712 674 (24 Hour) to fix an appointment to see our doctor regarding your hip stress fracture today.